NORTH MANKATO — Mankato West pounded the opposing pitching staff, scoring 10 runs on 14 hits as it handed New Ulm a five-inning 10-0 loss in the second round of the Section 2AAA softball playoffs on Thursday at Caswell Park. Earlier in the day, New Ulm spotted Hutchinson an early lead but came back to win 6-5, giving it the right to move on to play Mankato West. The Eagles threw out what would’ve been the game-tying run at home plate in the bottom of the seventh inning to preserve the 6-5 win. Meleah Reinhart earned the win against Hutchinson. She allowed two runs in six innings after Mariah Piotter allowed three runs in the first inning and didn’t return for the second inning. In that game, New Ulm scored the first two runs in the top of the first before Hutchinson went ahead 3-2 in the bottom of the first. New Ulm tied the game in the third inning on an RBI from Emma Bute, then took a 5-3 lead on a two-run single from Camryn Schiro in the fourth inning. Schiro ended the game with three RBIs. Teresa Ahlers drove in a run in the fifth inning to put New Ulm up 6-3, but Hutchinson scored one run in both the sixth and seventh inning to get within one. With nobody out and a runner on third, Hutchinson’s Elizabeth Wortz hit a fly ball to right field. Kaila Brudelie caught the ball for the first out, then fired home to throw out Allie Furth for the second out. New Ulm coach Kristi Andersen Loose said that her team did a good job of putting pressure on the Hutchinson defense, which made a couple errors that led to some New Ulm scoring opportunities. 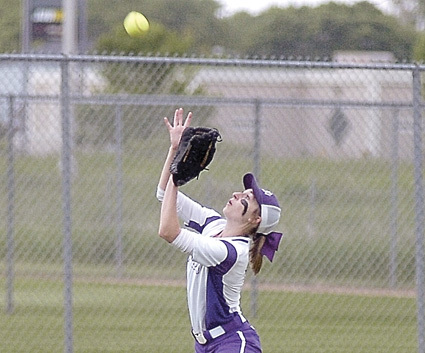 Kayla Brandes and Joey Batt each scored two runs against Hutchinson. While the offense was doing its job in the first game, the team was overmatched against the top-seeded Scarlets. West scored one in the first, two more in the second and a fourth run in the third inning. It put the game away in the bottom of the fifth as it scored six times. Ashlyn Donner took the loss. She allowed seven hits and three runs in two innings. Reinhart pitched the final 2 2/3 innings and allowed seven hits and seven runs. The Eagles weren’t able to get much going against West’s Briggs Carlson, who stranded five runners and allowed five hits. New Ulm plays in an elimination bracket game at noon on Saturday.